Start with a favorite glass artist bead. 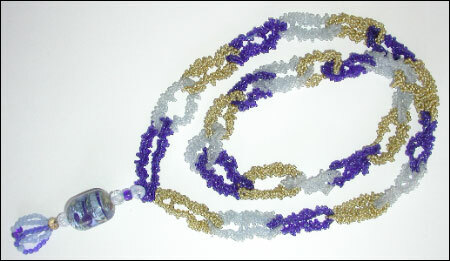 Select seed bead colors to match the art bead. Stitch a necklace of ruffled chain links. Add fire polished crystals to complete the look. 18 grams each: three different size 11/o Japanese seed bead colors for the variegated chain shown or a total of 55 grams of one color. An assortment of 3mm, 4mm, 6mm, & 8mm fire polished crystals to accent the art bead if desired.